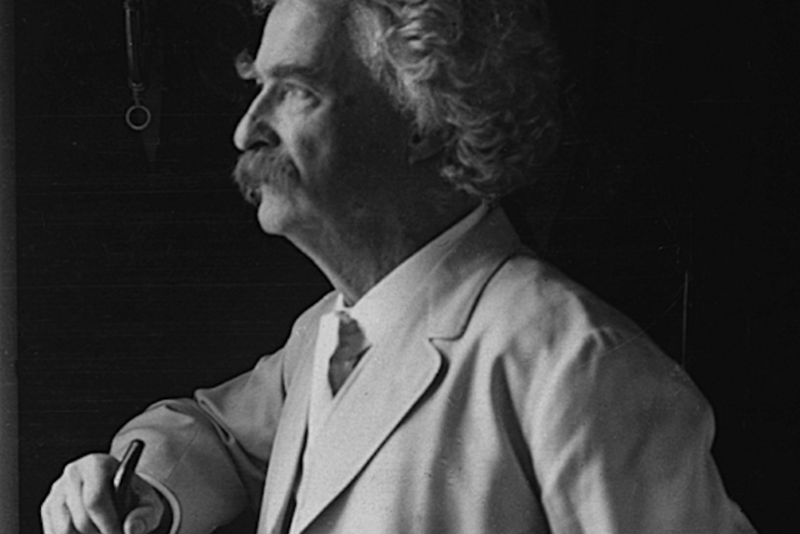 In the introductory lecture of Hillsdale College’sonline course on Mark Twain, which you can follow along with here, Larry Arnn, president of the college, explains why studying literature is essential to seeing and understanding the world. Arnn noted the symbolic nature of literature, a word that finds its roots in the Latin word for letter. When one sees the letters spelling out “cow” or “dog,” a picture of those words forms in the reader’s mind. Almost as if by magic — or rather, by a touch of the divine — the human mind is able to put pictures to symbols and alter the order of these symbols to cause one to recall pictures of different things. Good literature must closely align with reality in order to create an experience the reader can relate with. A story about a villain who is too villainous in a world totally devoid of hope may be a difficult experience for a reader to relate to and understand. What sets apart the writings of Twain, who was born Samuel Clemens, is that he often paints a picture of a world that was very close to the readers at the time. His characters possess universal qualities, and the way others react to the scrapes his characters get into reveals some of the societal underpinnings governing the world around them. Through two of his most famous characters — Tom Sawyer and Huckleberry Finn — Twain offers the reader a snapshot into 19th century America. Through the perspective of these two boys, Twain explains the political forces and societal trends that formed American culture in his day. In one of Twain’s most famous stories, Sawyer was tasked with painting a fence — a chore he shirks by pretending the job is a great privilege, then auctions the privilege of completing it to the highest bidder. When he is disciplined, his greatest offense is considered to be shirking his duty, which speaks to the honor-driven society that pervaded America at the time. A great deal of other lessons are contained within the pages of Twain’s work and will be drawn out and discussed throughout the next eight lectures in the series. Arnn, a former student of the late Harry Jaffa, says Jaffa once compared Tom Sawyer’s grand adventure along the Mississippi River to Odysseus’s trip along the water back from the Trojan War. Jaffa lamented that he would not have enough time in his life to write about Twain’s work, as he considered the late novelist’s writings to be on par with “The Odyssey” and “The Iliad” — two literary pillars upon which Western civilization were formed.